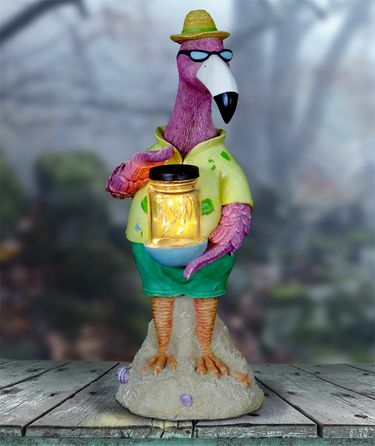 This fun loving Pink Flamingo holds a glass jar with a magical string of 6 LED illuminating firefly lights! Adorable flamingo statuary adds a tropical and endearing flair to your garden decor. Makes a great gift. A string of 6 solar powered LED lights automatically illuminate at dusk! Made of durable resin, UV treated to resist fading. Size: 5.5" x 5.25" x 13.5"H., approx. 3.5 lbs.